The problem with Resolutions (New Year or otherwise) is that they are made whilst in the most optimistic frame of mind and reality rarely matches our predictions. When I'd decided I'd try to get out for at least one nights bivvying/wild camping each month I was of course thinking of those lovely May/June evenings when it's warm enough to sit out under the stars with a hipflask and just watch the world go by for a bit before relaxing into a nice warm tent and a nice warm sleeping bag. Of course, in order to get through to May, I have a few colder months to endure first. Having put it off during the early, milder days of January, then watching as the freezing weather arrived, it was starting to look like I was going to fail at the first hurdle and as the end of the month approached, we were left with stormy conditions that looked somewhat less than inviting. Nevertheless, I made plans for a night on Loch Lomond-side, somewhere north of Rowardennan. I reckoned that would give me a simple cycle in and, at this time of year, it would be very quiet. As the days ticked away, it became obvious that this was a rubbish plan. The strong winds were all westerlies and the east shore of Loch Lomond would be taking the full brunt. A hasty re-plan brought up Tentsmuir Forest in Fife. This is an area I've wanted to explore for some time. I'd passed it on my North East Coast cycle tour a couple of years ago and seen the NCN1 signs but been unsure of how suitable the tracks would be for a touring bike with panniers and so gave it a miss. It also had the advantage that it wasn't too far away to get to and I could make some sort of loop out of it. The usual last-minute faffage saw me leaving Edinburgh behind schedule and more luggage issues at Leuchars meant I was a whole hour behind my self-imposed timetable when I set off. As a result, it was already getting dark as I started along the Fife Coastal Path and by the time I reached the edge of the forest I was already having to use the front light. This wasn't too much of an issue on the broad forest tracks but by the time I reached the trails through the dunes at Kinshady it was difficult to see far enough ahead to make good progress. What's more, the trails here are like a rabbit warren and it was hard to keep to the main trail. All I could do was keep the trees to my left and head north in search of a sheltered spot. At one junction, I headed towards the trees and I found an old WWII pill-box that had once been inundated by the dunes. It was very sheltered hereabouts - too much so in fact. There was little view of the sky and none of the beach. A couple of hundred metres further north, I found a much better spot. The forest was to my back, giving me shelter from the howling winds and I had an open outlook eastwards. A few minutes later the tent was pitched, the mat inflated, the sleeping bag unrolled and the water was on for a cook-in-the-bag meal. It was cold though - very - and I clambered into the sleeping bag still fully dressed as I sat to enjoy my food. A little Oban malt whisky and all was soon right with the world. After reading a few chapters of Life of Pi on my phone and another brew-up to get some heat, it was just a case of hunkering down for the night, listening to the roar of the wind in the trees and the occasional bird cry from the beach. That's when it started to get lighter and I knew I had to get out of the tent for a while. The moon was rising over the north sea against a dark, starry sky. I managed to get a couple of (poor) photos, wishing I'd brought a better camera with me. Then it was a few star-jumps to warm up again and back into the sleeping bag until morning. After looking at the weather forecast I'd already decided that I should make an effort to wake up around 5:30. The wind was due to change direction and I knew my little spot would be a bit exposed. However, as I flitted between awake and asleep all night, I was also aware that the rain had returned with a vengeance and when 5:30 came it was still lashing it down, the tent was still stable and I just hunkered down for another couple of hours. At 7:30, the rain had subsided and I opted for a quick breakfast so I could get everything packed away before it returned. My hands were getting numb rolling the tent up and doing up the straps but as soon as I was on my way again, I warmed up. I headed north to complete the coast ride round to Tayport and then back south via the Morton Lochs to make up a little loop. On the way I saw more pillboxes, an icehouse, deer and lots of rabbits. With lots of interest in Tentsmuir Forest, I feel it's an area I'll be back to explore further - both by bike and on foot. As I headed back along the Fife Coastal Path, I met one of the local rangers who was very, very interested in the bike. He'd seen my tracks from the night before and was intrigued by them. As we chatted he seemed very switched on to "evironmentally-friendly" low-impact of the wide tyres and I gave him some of my details to pass on to his colleagues. As I reached the van again at Leuchars, the heavens opened. Perfect timing. Overall, not a bad night out. All the gear worked, although I'll no doubt add/change a couple of things, and it was refreshing just to get out into the wilds again for a wee break. 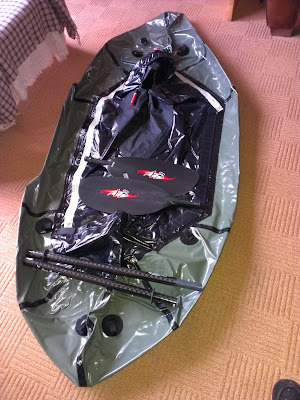 Plans for Februarys bivvy are already being formulated and this time it might be using the 29er.